The new hot thing… a lot of buzz…but what is a Progressive Web App (PWA)? Are they an app? A website? The name is confusing, but the potential upside PWAs offer online retailers is becoming increasingly apparent, as conversion rates from mobile traffic continue to stagnate, while traffic grows. In this post, I will shed some light on PWAs by explaining the problem they are trying to solve, what they are, and why this new mobile technology toolkit has a clear benefits for both consumers and merchants in an ever-increasingly mobile world. Online retailers have a big problem: stagnant mobile conversion rates. When Responsive Web Design (RWD) took the e-commerce world by storm five years ago, retailers happily jumped at the chance to offer a “one site for everyone” strategy that simply reformatted their desktop sites to fit smaller screens. It sounded great and, while there were sacrifices in page-load times, many online retailers welcomed the perceived simplicity and reduced workload that RWD promised. When mobile was 20-30% of traffic, the benefits of not having to manage “another mobile site” might have made some sense. But, as mobile traffic surges past 50, 60, 70 or even 80% for some retailers, the fact that mobile and desktop are inextricably linked by RWD (as a single site) is starting to become a big pain point. Remember, the mobile site is really just a reformatted version of the responsively built desktop site and, as such, stagnated mobile conversion rates cannot even be addressed as a specific problem to solve. Mobile page-load times (performance) remain the weak link for RWD sites and are a primary contributing factor in poor conversion metrics. Report after report shows a direct correlation between page-load time increasesand conversion rate decreases. One reportshowed a 27% lift in conversion rates, for each second of pageload time improvement. Building a robust desktop retail experience is of course crucial, but trying to cram that same rich experience into a smartphone by simply re-formatting the pages is clearly not working. As evidence of this fact consider that, according to a Monetate report, the US mobile conversion rate for retailers in the US was 1.54% in Q1 2017, a DROP from Q4 2016, when it was 1.65%. Looking back even further to the quarterly reports between 2013-2017, we can see that mobile conversion rates stay stuck between 1 and 2%. Essentially, these numbers have been static and unimproved for 5+ years. In this same time period, the average percentage of global web pages rendered to mobile devices jumped from 16% in 2013 to over 50% in 2017. Can Apps Fill The Void? For an increasing number of retailers, commerce-enabled native apps offer some relief from this conversion problem, since they convert at a rate that is typically 4-6X higher than mobile web traffic. Apps load fast and sit on the consumer’s smartphone, always-on, and ready to take orders. While apps have to be discovered and downloaded, they are a powerful way to drive deeper engagement with the statistically smaller percentage of users that drive the majority of a retailers business. According to a 2017 Criteo report, app conversion rates for retailers were measured at 18% in Q4 2017. According to this same report, for retailers with both an app and a mobile optimized site, in Q4 2017, native apps were responsible for a whopping 66% of mobile sales. In Q1 2018, the conversion rate for apps increased to 20%. Google has likely been watching the move to apps trend with some dismay, since they are not very good at indexing Apple’s “walled garden” within the app store. The more traffic and transactions occurring on native apps, the less Google knows what is happening—and this impacts its ability to make advertising hay from the data it extrapolates from this web activity. For Google and their adwords bots, iOS app based retail interactions are like a “blind spot”. Google is a smart company, with smart people working for them. 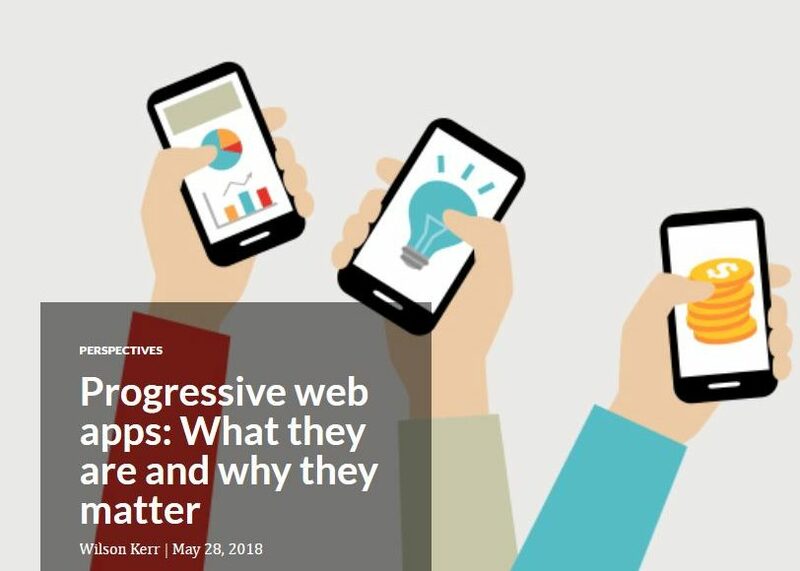 So, in 2015, Google saw his trend toward apps coming and introduced a solution to the mobile website conversion problem called Progressive Web Apps (PWAs). This is an odd choice in a name, since this is really a toolkit for increasing browser-based mobile site performance by mimicking on-device caching of data. (Why they put the word “apps” in the name is beyond me… but I digress). Despite the word “app” on the name, PWAs are not apps. They are a methodology. A set of guidelines. A toolkit. A list of rules to follow for developers, allowing them to build and render mobile sites in ways that significantly improve their pageload times/performance. They do this by merging the best of what apps offer (speed) and the best of the mobile web (easy access by anyone). And, because the PWA “shell” is separated from the content that is served within it, the experience just “feels” more app-like. It’s on-device, fast and removed the “disconnect” that slow pageload speeds can impart. The reason this has a massive impact on performance is that the data used to render the mobile commerce experience does not need to be called up each time. It is already there, cached/stored on the phone, so pageload times are nearly instantaneous. Remember that statistic about each second of pageload time being linked to a 27% increase in conversion rates… ? Another benefit of PWAs is that they mimic one of the big native app differentiators: push notifications. Again, since the “shell” of the PWA is “downloaded” and stored on the user’s homescreen, like a native app, a retailer can send messages that pop up, only to customers who choose to add the icon to their phone. Since it’s likely that this message is going to a very dedicated customer, it is also highly likely they will act upon that call to action in the message and buy something. This helps drive increased conversion rates. Google has wisely created a tool for measuring PWA compliance (called Lighthouse) and is pushing the advantages of compliance while it continues to educate the developer community and court big retailers. Google has a seriously valuable carrot to dangle for retailers considering adopting the PWA standards, in the form of promised preferential SEO page-rank. Reaping the rewards of turbo-charging their Google page-rank might be reason alone to move to a PWA (regarding ROI) for some. For a while, Google and its Android OS was alone in supporting Service Workers. But, as developers started using the PWA toolkit and seeing results, a lot of pressure was put on Apple and it finally introduced support for Service Workers in its latest iOS version release. Translation: PWAs (and the Service Workers so key to their advantage) now work on iPhones! For many retailers we work with, this was cited as a reason they were staying in wait-and-see mode on PWAs. While Google is getting some PWA traction among content-serving websites, retailers in the US have been slow to jump on board. Even with Apple supporting Service Workers, many retailers are so deeply entrenched with their (slow on mobile) RWD sites that the notion of going “back to the future” and launching a dedicated “m-dot” site causes them angst. Currently, there are only a few US retailers with live PWA mobile sites. One worth mentioning is Lancôme. We currently have several large PWA projects underway and are starting to get requests for more information. If a PWA is on your radar or if you have questions, please reach out. A PWA is a powerful new solution to poor performance that retailers should be researching and considering, in direct proportion to their awareness that having a poor (and static) mobile traffic conversion rate is not sustainable in the face of every-increasing mobile traffic numbers. I should probably note here that PWAs are not just for mobile and can improve desktop site performance too. But, for retailers, mobile is where the pain point is and, as such, where PWAs have the most potential to move the bar. For mobile shoppers, there is nothing but upside, as they will still browse at retail websites. When they do, they will experience nearly instantaneous page-loads and have the ability to “download” or pin an icon to their device home screen, like an app. If they choose to, they can receive special web-served offers that pop-up on their smartphone, just like native in-app push notifications. But, importantly, they never had to go to an app store and download a native app to their phone. For merchants with repeat buyers and a dedicated customer base, PWAs offer a powerful new way to deliver a browser-based mobile experience that offers the speed of an app, and will boost their Google SEO page rank. Even if a plan to build and launch a native app is in place, it’s time to think about treating mobile browser traffic as unique and worthy of an experience that can finally move the needle and improve long-stagnant conversion rates. To learn more about PWAs and/or to discuss how a PWA can help you increase mobile page-load times and lift mobile conversions, please reach out to Wilson Kerr via wilson@unboundcommerce.com or click here.